In Odoo, tasks are performed by creating modules. Modules customize the behavior of an Odoo installation, either by adding new behaviors or by altering existing ones (including behaviors added by other modules). This will automatically create a my-modules module directory with an academy module inside. The directory can be an existing module directory if you want, but the module name must be unique within the directory. We have a "complete" module ready for installation. Controllers interpret browser requests and send data back. Generating HTML in Python isn't very pleasant. The usual solution is templates, pseudo-documents with placeholders and display logic. Odoo allows any Python templating system, but provides its own QWeb templating system which integrates with other features. The templates iterates (t-foreach) on all the teachers (passed through the template context), and prints each teacher in its own paragraph. Finally restart Odoo and update the module's data (to install the template) by going to Settings ‣ Modules ‣ Local Modules ‣ Academy and clicking Upgrade. Odoo models map to database tables. In the previous section we just displayed a list of string entered statically in the Python code. This doesn't allow modifications or persistent storage so we'll now move our data to the database. this simply gives read access (perm_read) to all users (group_id:id left empty). Data files can be used for demo and non-demo data. Demo data are only loaded in "demonstration mode" and can be used for flow testing and demonstration, non-demo data are always loaded and used as initial system setup. In this case we're using demonstration data because an actual user of the system would want to input or import their own teachers list, this list is only useful for testing. Restart the server and update the module (in order to update the manifest and templates and load the demo file) then navigate to http://localhost:8069/academy/academy/. The page should look slightly different: names should simply be prefixed by a number (the database identifier for the teacher). Odoo bundles a module dedicated to building websites. So far we've used controllers fairly directly, but Odoo 8 added deeper integration and a few other services (e.g. default styling, theming) via the website module. The website layout also provides support for edition tools: click Sign In (in the top-right), fill the credentials in (admin / admin by default) then click Log In. You're now in Odoo "proper": the administrative interface. For now click on the Website menu item (top-left corner. Controller methods are associated with routes via the route() decorator which takes a routing string and a number of attributes to customise its behavior or security. restart Odoo, access http://localhost:8069/academy/Alice/ and http://localhost:8069/academy/Bob/ and see the difference. Restart Odoo, access http://localhost:8069/academy/2, note how the old value was a string, but the new one was converted to an integers. Try accessing http://localhost:8069/academy/Carol/ and note that the page was not found: since "Carol" is not an integer, the route was ignored and no route could be found. Restart Odoo and upgrade the module, then you can visit each teacher's page. As an exercise, try adding blocks to a teacher's page to write a biography, then go to another teacher's page and so forth. You will discover, that your biography is shared between all teachers, because blocks are added to the template, and the biography template is shared between all teachers, when one page is edited they're all edited at the same time. Restart Odoo and update the views, reload the teacher's page and… the field is invisible since it contains nothing. Restart Odoo and upgrade the module, there is now a placeholder under the teacher's name and a new zone for blocks in Edit mode. Content dropped there is stored in the corresponding teacher's biography field, and thus specific to that teacher. The teacher's name is also editable, and when saved the change is visible on the index page. 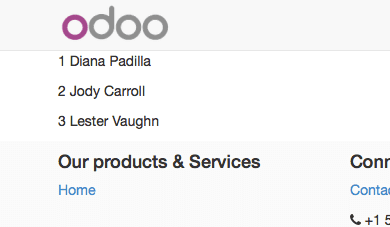 The Odoo administration was briefly seen during the website support section. We can go back to it using Administrator ‣ Administrator in the menu (or Sign In if you're signed out). a view has a type, a broad category to which it corresponds (a list, a graph, a calendar) and an architecture which customises the way the model is displayed inside the view. By default, an Odoo model is essentially invisible to a user. To make it visible it must be available through an action, which itself needs to be reachable, generally through a menu. then accessing http://localhost:8069/web/ in the top left should be a menu Academy, which is selected by default, as it is the first menu, and having opened a listing of teachers. From the listing it is possible to Create new teacher records, and to switch to the "form" by-record view. We have seen a pair of "basic" fields stored directly in the record. There are a number of basic fields. The second broad categories of fields are relational and used to link records to one another (within a model or across models). Odoo provides technical models, which don't directly fulfill business needs but which add capabilities to business objects without having to build them by hand. One of these is the Chatter system, part of Odoo's email and messaging system, which can add notifications and discussion threads to any model. The model simply has to _inherit mail.thread, and add the message_ids field to its form view to display the discussion thread. Discussion threads are per-record. At the bottom of each course form, there is now a discussion thread and the possibility for users of the system to leave messages and follow or unfollow discussions linked to specific courses. Odoo also provides business models which allow using or opting in business needs more directly. For instance the website_sale module sets up an e-commerce site based on the products in the Odoo system. We can easily make course subscriptions sellable by making our courses specific kinds of products. Rather than the previous classical inheritance, this means replacing our course model by the product model, and extending products in-place (to add anything we need to it). restart Odoo, update your module, there is now a Shop section in the website, listing a number of pre-filled (via demonstration data) products. With this installed, a few courses are now available in the Shop, though they may have to be looked for. We're left with the alteration of existing records and the alteration of existing views. We'll do both on the Shop pages. View alteration is done by creating extension views, which are applied on top of the original view and alter it. These alteration views can be added or removed without modifying the original, making it easier to try things out and roll changes back. Since our courses are free, there is no reason to display their price on the shop page, so we're going to alter the view and hide the price if it's 0. The first task is finding out which view displays the price, this can be done via Customize ‣ HTML Editor which lets us read the various templates involved in rendering a page. Going through a few of them, "Product item" looks a likely culprit. The second thing we will change is making the product categories sidebar visible by default: Customize ‣ Product Categories lets you toggle a tree of product categories (used to filter the main display) on and off. This is done via the customize_show and active fields of extension templates: an extension template (such as the one we've just created) can be customize_show=True. This choice will display the view in the Customize menu with a check box, allowing administrators to activate or disable them (and easily customize their website pages). With this, the Product Categories sidebar will automatically be enabled when the Academy module is installed.